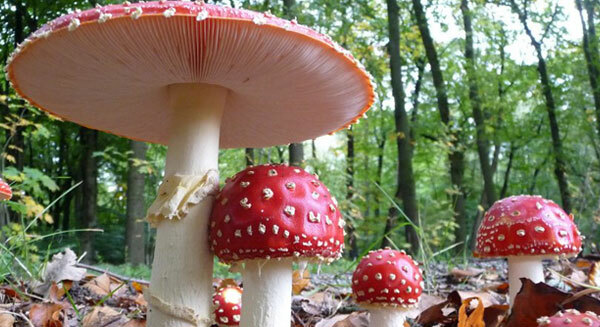 These cute little mushrooms look like cartoons: red capped with little white spots — they’re just absolutely adorable. They rarely kill people, though death is possible. Their muscimol and ibotenic acid produce unpredictable hallucinations, and since it’s hard to know how much chemical is in any particular cap, you might get a mild trip or you might be incapacitated, develop seizures, or wind up in a coma. They can also produce amnesia. In some Siberian cultures, it’s not unusual for a shaman to eat the mushroom, then for other people to drink his urine. The shaman might act as a filter, since it’s said that the negative effects are decreased if you drink it in someone’s pee. But you still get to drink someone’s pee though, so there’s an upside, if that’s your thing.